Acura is shaking up its marketing approach with one of its first corporate branding forays into entertainment. Acura is shaking up its marketing approach with one of its first corporate branding forays into entertainment. 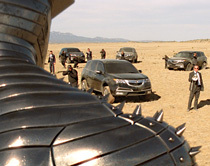 In partnership with Marvel Studios, Acura will feature various products, including its new TL, in the film Thor, slated to debut May 6. In exchange for unpaid placements, Acura will promote the film through its related marketing efforts. "Being in the movie was great, but it's really what you do outside of the movie where you have the biggest opportunities," says Susie Rossick, brand manager of Acura national advertising. She says an interactive strategy around the placement, comprised of a microsite, joinshield.com, social media, and an ad buy, rep- resents a way for Acura to expand its reach beyond the 25- to 49- year-old male demographic. "I wouldn't say it's more integrated than other campaigns, but it's differently integrated," she says. "We've never branched out and done something this big with placement in a movie." All ad and pre-launch promotion was designed to drive traffic to the microsite, where consumers are encouraged to play a game in which they're assigned case studies as an agent of S.H.I.E.L.D., a fictional organization in Thor. Every element of the campaign was built to drive traffic and brand interactivity via the microsite, says Ferdie Taga- nas, VP at rp&, the lead creative shop on the account. Prior to the site launch, and an ad referencing the game, on April 11, recruitment centers were set up at auto events and conventions, such as the New York Auto Show, to pre-register consumers as agents and merge their information into the Web program. Dealers will also preview the film to customers the week prior to the release. The team also worked with fashion designer Richard Chai to create a custom S.H.I.E.L.D.-branded product sold at various outlets. "It was a unique way for fans of Thor, and for the general audience to feel like part of the movie through Acura," Rossick says. "This is about general awareness of the brand."